In a note to investors seen by AppleInsider, Citi advised it does not expect Apple will miss its sales guidance for the next quarter, but it does anticipate the figure to be closer to its forecast of $89 billion in revenue than the higher-end $93 billion. The problem again seems to be one of seemingly over-anticipated demand for the current generation of iPhones, with newer models like the iPhone XS, and iPhone XR seemingly not keeping up to analyst expectations, and some suppliers warning of reduced revenues from cut orders. Older iPhones are seen to be more of an attractive purchase for some consumers compared to the new releases. "We have found the legacy iPhones are doing better than expected due to the price reductions, which makes the legacy iPhones more affordable in developing countries," wrote Citi. The ongoing trade war between the United States and Apple was also touched on in the note, with analysts suggesting that, while the United States has considered applying tariffs to iPhone imports, "we do not expect China to ban or impose additional tariffs on Apple." "However, we note that should this occur, Apple has material exposure to China," claims Citi. In theory, this exposure represents some 18 percent of Apple's total sales, which could be majorly affected if tariffs are applied by either side. The trade war is the biggest concern for Citi, prompting it to reduce its price target for Apple from $240 down to $200. "Trade wars are bad for tech stocks," the firm added. While currently setting the price target at $200, Citi also mused on where the price could end up based on predictions. In a bear case, if Apple's revenue growth slowed down to between 2 percent and 3 percent a year, and suffered from weaker gross margins than forecast, the stock price could fall as low as $125 per share. "For the stock to move higher, we believe investors will await for consensus estimates to move lower," suggests Citi. Citi is the latest firm to cut its estimates for Apple's stock price target in the last few weeks, with takes from Morgan Stanley, UBS, Rosenblatt Securities, HSBC, and Guggenheim Securities all hammering the company over reduced hardware unit growth and a belief the high average selling price for iPhones will not be sustainable. iPhone XS Max is $1,449.00 now. I wonder how high the price will go now. Meh. I'm fine with my iPhone 7. The BBC is calling it a trade war as well. If it’s good enough for the BBC, it’s good enough for me. I am not cheap when it comes to buying Apple gear but I had to put the brakes on yesterday. I have the 7 Plus and love it but 32 GB is less than ideal now I use it as an iPod for my Car Play and I obviously have a limit on the number of albums I can load in. I was in our Mall for a wander around with my wife yesterday and surprisingly (cough cough), I found myself in the Apple Store and asked to see the 64 GB XR. The chap there looked at my iPhone and looked it up and said it was a $250 trade-in in excellent condition. In the end, I realized I love the 7 Plus but as a keen photographer, I have my Sony a7 iii and Canons so it's not about the cameras in iPhones for me and dang, I was really looking for an extra 32 GB for music and it was going to cost me $499. I decided I'll just swap out the albums more often on the 7 Plus! 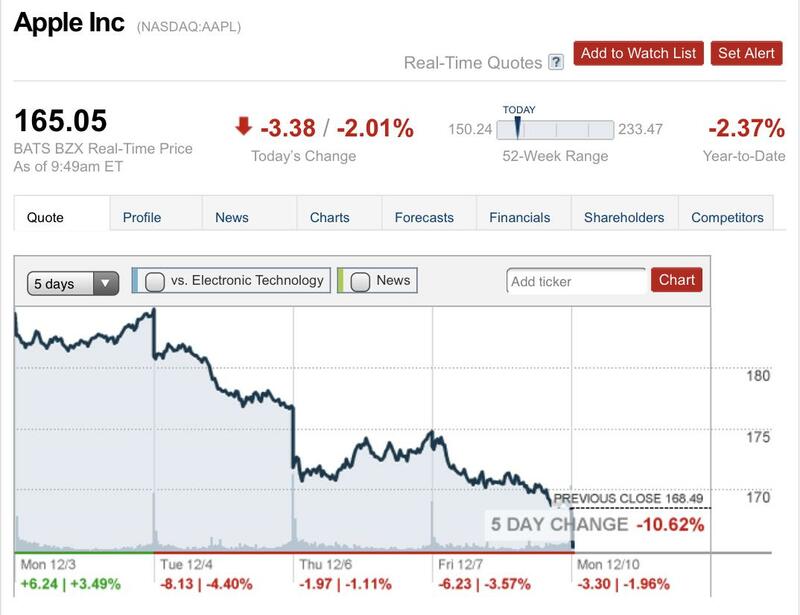 Apple is a bad investment. Please sell your shares. What's going on is the kind of thing, among other kinds of things, which has traditionally been referred to as a trade war. Whether or not we think it's prudent policy, it's fair to call it a trade war. Microsoft, and now Amazon have a higher market cap than Apple. Soon Alphabet/Google will too. 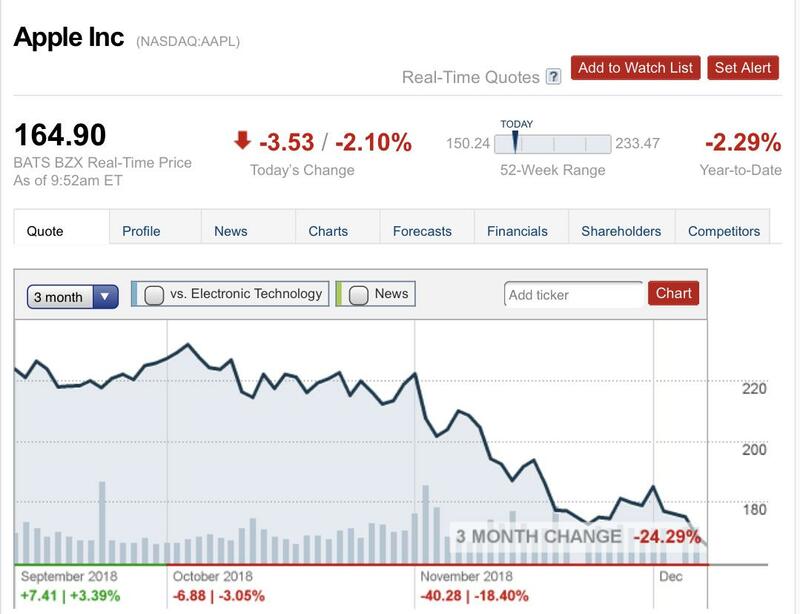 Apple stock is down 25% in the last three months and 2.3% for the year. It actually ranges from $1099-$1449 or $54-$68 per month. The iPhone 7 is a good phone and will last quite a while but so will the XS max. Given a 5 year life the lower cost version of the iPhone would cost around $18/month. Hopefully no one will follow your ill advised advice of selling low without first seeking out someone who knows what their talking about, investment wise. You will always get more selling Apple gear back on the market than trading in at the store. That’s the top-tier offering. Do you need the top-tier offering? If not, why is that noteworthy? I don’t need top-tier powertools and routinely buy lesser offerings. So? And? What are you trying to suggest, that Apple products are somehow shittier now than they were just a short while ago when they had the largest market cap in history? Did they magically transform? More pointless pearl clutching. Yawn. "Trade wars are bad for tech stocks," This says it all. It has nothing to do with Apple products or even their cost but everything to do with the reckless application of tariffs. Someone is making money on the drop of AAPL stock (actually lots of people) as well as on every company tariffs are applied to. These companies are basically service companies with little to no impact from tariffs. That's why they haven't been affected by 10-20% tariffs. I'm in the same boat. I'd like to upgrade my 6s for a Xs or Xr to get a better camera, but $1250 is a big pill to swallow. Yes, you can do like the credit card companies do and break it up into monthly payments so the number looks low, but it doesn't change the amount that you're paying. iPhones last longer than others, but 5 years is being over generous, IMO. 3-4 is a more reasonable expectation. As for stock price and market cap, why does it matter? There are several people here who have invested heavily AAPL and every time the stock goes down the is much wailing and gnashing of teeth. Does that affect how your iPhone or MacBook work? If you don't sell your shares, how can I buy them? Please sell your shares. I thought Apple products were excluded from tariffs? Waiting for you to resurrect Michael Dell’s retort about Apple those many years ago. Come on, you can do it, hater. Last I heard they were going to be included. I think Trump just bought a new iPhone so he's not worried about the price. I pretty much agree with you on all of that personally but for some that can’t take the budget hit the 5 year mark is another way of justifying an upgrade. I also agree that this obsession with high hardware prices seems to find any excuse to rage on, even if there’s no real correlation with that and stock price. My stock purchases won’t be based on this short term dip. Edit: I meant that my stock sales won’t be affected by this downturn. I may actually buy some if, after running the numbers, it makes sense. If stock price and market cap don’t matter why does AI post stories every time some Wall Street analyst changes their price target or issues a research note?